What&#039;s this sub-mesoscale thing about then? How are we observing these flows? How can we observe these flows in the ocean? How do we go about observing these flows in the ocean? What is the OSMOSIS consortium? What's this other sub-mesoscale thing about then? Why was the OSMOSIS project created? Why's the project called OSMOSIS? What's this sub-mesoscale thing about then? The second part of the study is the investigation of sub-mesoscale interactions in the ocean. To get a grip on sub-mesoscales, we first have to understand what mesoscales are (pronounced as 'miso' like a soup or 'mezzo' like a soprano according to your preference). The mesoscale is a shorthand used by oceanographers for flows which have a medium (or 'meso') length. This excludes flows which take up the whole of an ocean basin (such as the 'gyre' circulation) as well as 'finescale' flows such as those associated with surface waves. This mesoscale is mainly made up of rotating vortices, which are the ocean equivalent of the high and low pressure systems of the atmosphere. The advent of satellite beautiful swirling structure they give rise to. Sub-mesoscales are then flows which are smaller (1-10 km) than the mesoscale flows (10 - 200 km). If the mesoscales are the ocean equivalent of high and low pressure weather systems, then sub-mesoscales can be compared to the warm and cold fronts which often associated with the most dramatic weather. They are difficult to measure observe, but their effects may be seen in pictures of the ocean surface, if they twist and stretch blooms of marine algae. Do the sub-mesoscales do anything? This is a question which is generating plenty of debate amongst oceanographers today. The answer seems to be a tentative 'yes', though there is a lot of work to do in order to make that answer more resounding. One of the main areas of research is the effect submesoscale flows can have on life in the ocean. The growth of marine plants (or algae) is held back by the "dilemma of the two-layered ocean"[footnote]. This dilemma is the tendency for the ocean to have a layer near the surface which has plenty of light - but few nutrients. The second layer lies below this. This layer is nutrient rich, but is too dark for plants to grow. This ocean is only able to overcome this dilemma in certain regions - as shown by the map below which shows an estimate of growth in the ocean every year. 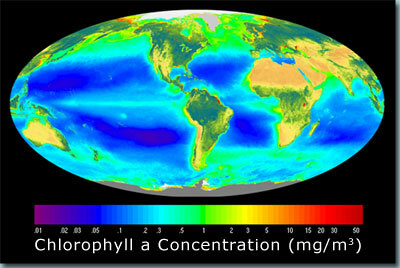 Global chlorophyll concentration: Map of chlorophyll a concentration. Red or green colours indicate high levels of growth, while blue areas have much less life. Surprisingly, many of the areas where high growth are found in the ocean are in the cooler regions, reversing the overall pattern for land-based ecosystems. There are a number of large regions where the ocean can solve the 2-layer dilemma. For example, the special conditions found at the equator in the Pacific lead to cold, nutrient rich water to be drawn up from the deep there, while the shape of the sea bed off western Africa leads to a similar effect. Submesoscale processes are likely to be more important in regions such as the northern parts of the Atlantic and Pacific oceans (along with a variety of other, larger scale processes). Submesoscale flows become important in regions where there are large temperature differences over short distances. When these conditions arise, the colder, heavier water tries to flow underneath the warmer, lighter water (see the page on What we can observe in the ocean for some background on this). This up-and-down movement can bring nutrient rich water up into the light-rich surface layer. Evidence for such flows in the real ocean remains limited. Photos of the ocean surface (such as that above) suggest that submesoscales interact with ecosystems in the ocean, as the plankton has the same twisted, convoluted structure as submesoscale flows. The reason for this caution is that submesoscales are uniquely difficult to observe in the real ocean or to model with computers. They are difficult to observe as they are too small and develop too quickly to be observed clearly using satellites. It is not much easier to observe them using instruments deployed in the ocean, as the precise location and time where they develop cannot be predicted with certainty. The instruments must also be deployed close together to be able to observe their small-scale structure.